Ken Tyrrell's big Elf-assisted effort with the interim March chassis in 1970 aside, Jo Siffert winning the 1968 British GP has gone down in the books as the last genuine privateer victory in Formula 1. The record also shows that this was the Grand Prix which saw the debut win of a car mounted with one of the unwieldy high aerofoils, which made their first appearance two weeks earlier at the French Grand Prix at Rouen. The car kicking off the age of aerodynamics with a win was, fittingly, Chapman's dazzling Lotus 49 fitted with a Cosworth DFV engine. Just as fittingly, the private entrant performing the coda to the old era was English gent Rob Walker, F1's most successful privateer in history. Walker is best known for teaming up with Stirling Moss, entering latest-spec Coopers and Lotuses for the patriotic Brit, who drove Rob's cars to many successes in Championship and non-Championship Grands Prix. Walker's F1 involvement was to last well into the seventies, his final act entering the works Surtees team as the Brooke-Bond-Oxo/Rob Walker/Team Surtees. But his heydays were during the late fifties and sixties - after Moss bowed out of F1, Walker signed allrounder Joakim Bonnier who drove Coopers and then Brabhams for the team until 1966. Meanwhile in 1964, Swiss Jo Siffert had joined Walker as a second driver with his self-acquired Brabham-BRM, soon striking up a close relationship with Rob and remaining faithful to the King of Privateers until 1969. In their first years together there was nothing in the way of results, due to the bulky Cooper-Maseratis he and Bonnier were driving. Things changed in 1968 when Walker persuaded Chapman to provide Siffert with a Lotus 49. 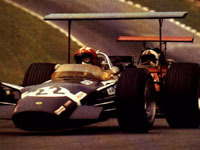 'Seppi' instantly turned into a frontrunner in F1, sometimes even outpacing works driver and Champion Graham Hill, who took over the Walker drive in 1970. Siffert's great day came at the British Grand Prix where he snatched a welcomed victory from polesitter Chris Amon in his Ferrari, one of the many times the poor Kiwi so nearly missed out on the top spot. After this striking episode in Grand Prix racing Siffert's form with the Walker team deteriorated through 1969, but he turned into a mainstay of John Wyer's Gulf Porsche sportscar team, winning five enduro races that season. A disappointing year in the works March was followed by a switch to BRM where a dominating performance in Austria saw him win his second Grand Prix. Shortly after finishing a strong second at the Glen, Siffert lost his life in the 1971 end-of-season Victory Race, crashing his P160 into a bank, ironically at the track on which he won so gloriously in 1968. The car burst into flames with Jo trapped in the wreckage. He only suffered a broken leg from the impact but suffocated in the fire.